"I have found Dr. Jones to be an excellent doctor who, along with her staff, truly cares about their patients. Most recently, I appreciated her kindness and the care shown to my cat, Snowball. Every effort was made to prevent surgery, but when surgery became necessary, Dr. Jones set up a quick, same day, appointment for a colectomy to be performed by an excellent surgeon. I was even more impressed by the fact that it was the surgeons afternoon off. I'm sure Snowball would like to extend his gratitude too. Thanks to Dr. Jones, he is living a normal life again." -Margie E.
"Dr. Jones, Thank you for working so hard to save me from another surgery. And to the staff, thanks for all the love and care you showed! Love, Sadie! Many thanks to all of you, Melinda B." "Thank's for being so nice and gentle with Sparky! Everyone has been so nice in helping Sparky and us get through this time! MANY THANKS to you, Ryan, Daniel, Jessica and Beth for helping me with Bella and her puppies and their all-day exam session!!! I'm so thankful to know that the puppies are so healthy and I will promise to keep Bella and treat her condition in order to make her as comfortable as possible. I hope Bella can have a long life with me and my family. I want to share with you good news about her first puppy t o find a forever family. Ryan was so kind to call me on Saturday and put me in contact with Melissa W. I had the extreme pleasure of meeting with the W. family yesterday and they met all the puppies. They decided to go home with the largest female of the litter and they named her Sadie...she is a VERY LUCKY girl and I feel so blessed to have met the W. family!! I truly appreciate your introducing Bella and her pups on your Facebook page and I even more appreciate your expertise and compassion to help me care for my canine family!! I wish I could keep all the puppies, but Bella needs my close care and her puppies need the opportunity to grow up in loving homes with dear people like the W. family!! 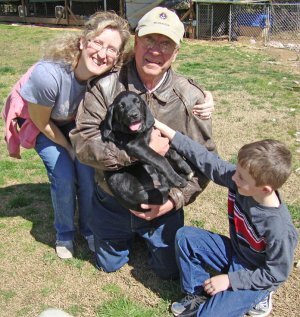 I'm attaching a picture for you of Sadie and her new family. THANK YOU so very much for making this sweet adoption happen!! Thank you for EVERYTHING that you do for the S. family...WE LOVE YOU ALL!!! Lots of bear hugs (and puppy kisses! ), Lisa :-)"
Dr. Jones and staff, The care and love you have shown Sadie, Gideon and Buddy means the world to me. I just wanted to let you know how very much you are appreciated! Thank you, Melinda B. 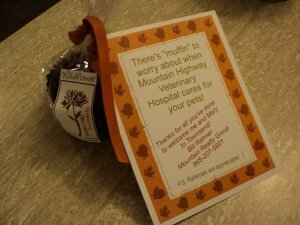 We value our clients' experience at Mountain Highway Veterinary Hospital. If your pet or animal is currently a patient, please feel free to complete the following Client Experience Questionnaire. The Questionnaire is in Adobe Acrobat format, and requires the free Acrobat Reader to view.